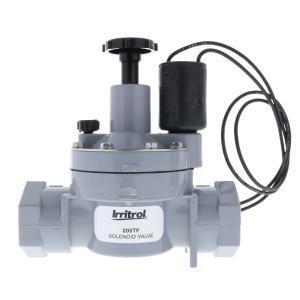 This Irritrol® 205 Series Valve is a 1” FPT plastic model electric globe valve. Very dependable operation in potable and dirty water applications and success in a variety of environments make this a leader in the irrigation industry. Optional flow control feature for precise flow adjustment to meet your application needs. Constructed of heavy-duty, corrosion and UV-resistant PVC, the 205 Series features a high-flow, low-friction-loss-design for efficiency and low-flow capabilities. Friction loss data shown in chart below.